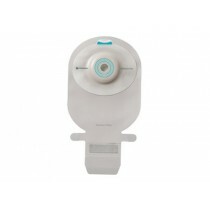 A one-piece ostomy bag, manufactured by Coloplast, is a medical apparatus that jointly combines an ostomy pouch and skin barrier. The pouch collects urine or stool and the skin barrier fits around a stoma to shelter the skin. The combination allows user convenience for all of your ostomy and waste collection needs, including colostomy, ileostomy and urostomy care. More specifically, one-piece ostomy bags are easy to apply and remove because of the unit's merger. Ostomy pouches, additionally, are highly flexible so users can move easily and with confidence. Ostomy care, whether it's colostomy, ileostomy, or urostomy, becomes hassle-free and convenient with our wide selection of Coloplast one-piece ostomy pouches. To find the best products for your individual needs, peruse our wide selection of one-piece ostomy bags today!